“The Meaning of the Digital Humanities.” Duke University. 11 October 2012. Storified tweet stream from the talk. “Creating a Humanities Advocacy Media Plan in the Digital Age.” Meeting of the Faculty Steering Committee for the Carolina Digital Humanities Initiative. University of North Carolina. 9 October 2012. Alan Liu and William G. Thomas III, “Humanities in the Digital Age” (Inside Higher Ed — Views, 1 October 2012. “3 key Digital Humanities Trends: How Digital Humanities Registers Changes in the Humanities Today.” National Humanities Center. 5 October 2012. “When Was Linearity? — Linear Thought, Graphics, and Freedom in the Age of Knowledge Work.” North Carolina State University. 3 October 2012. “Digital Humanities, Pedagogy, and Tomorrow’s Humanities — An Informal Presentation.” North Carolina State University, 3 October 2012. 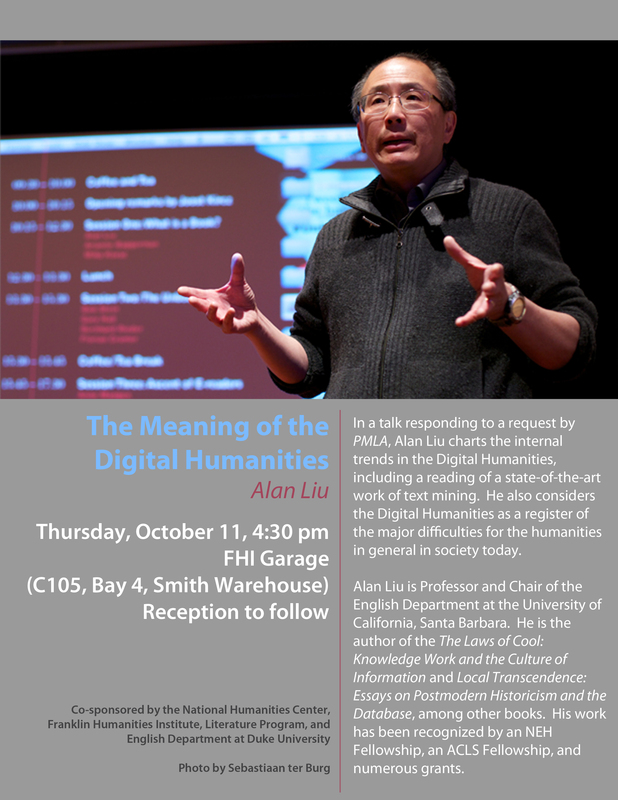 Alan Liu and William G. Thomas III, “Humanities in the Digital Age.” Inside Higher Ed — Views, 1 October 2012. Good strategy requires picking some point on the line to apply leverage. The leverage point in the policies now shaping the future university is the digital, and we feel that it is crucial that the humanities try for well-conceived, humanities-friendly models of digital work that are institutionally cohesive enough to influence policy.